Great property behind the St. Francis Church in Orangeville. Front 9 somewhat open, but trees and pins force a variety of shots. Back 9 mostly wooded with tighter fairways. Alt pins add length and difficulty. Orangeville. 7 miles east of Hwy 131. 2 miles south of Gun Lake. Park in the grass parking lot for the course NOT in the church lot. 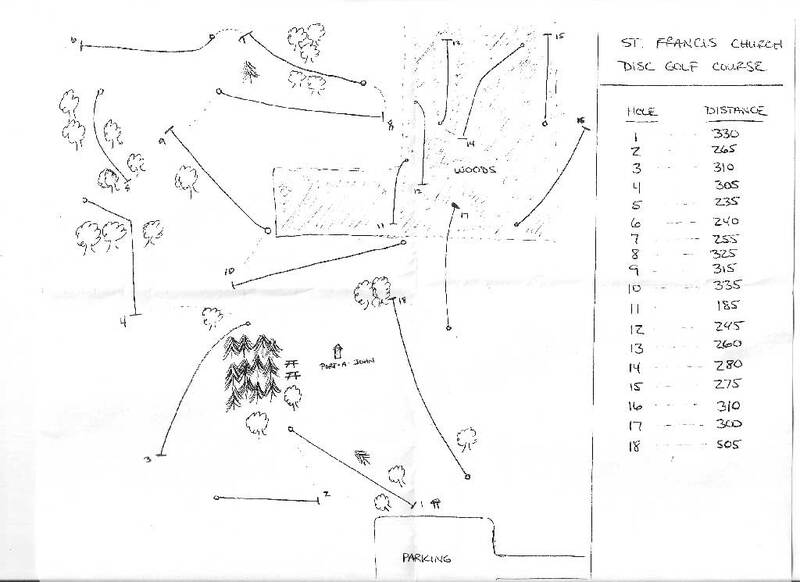 Fun course on a nice remote piece of land. With tee signs and concrete tees it could rate as a 4 easy! this course is not bad but they need better markers letting you know the distance from tee to basket and where the basket is. Now that there are permanent baskets on all 18 holes -- this course becomes a must play in the West Michigan area. Not the longest of courses, but some tough basket locations and alternate pins can add a challenge. Only thing missing on this course is a water hazard hole. Rarely crowded - lots of fun.